The Carers (Scotland) Act 2016 places a duty on local authorities to set out an eligibility criteria for carers. Health and Social Care partnerships have a duty to support carers who meet the eligibility criteria threshold for funded support. This is in addition to the power they currently have to support all carers. 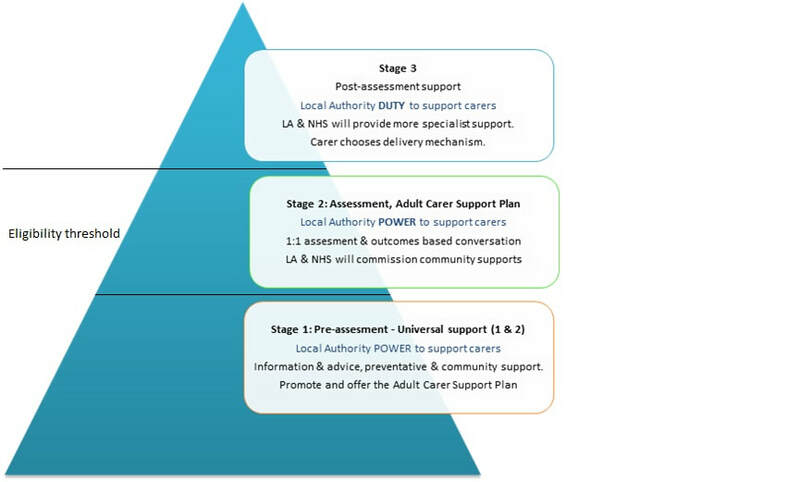 Once the carer's outcomes have been identified through their support plan, it must be identified what level of support they are entitled to. If a carer does not meet the eligibility criteria, they are still entitled to support, and must be offered a Carers Support Plan. To arrange this, contact the Borders Carers Centre here. The eligibility criteria assesses the level of support required by individual carers by measuring the level of risk. The sooner a carer is referred to the Borders Carers Centre for the Carers Support Plan, the sooner preventative measures can be put in place and help avoid potential future crises.